How to Waterproof Concrete. Science Lessons. Two or three decades ago, Japan spent a fortune trying to keep their economy moving by building huge infrastructure projects. Some years later many repairs were needed to the concrete. It turned out the labourers had been reluctant to do the heavy work vibrating the concrete properly so some concrete was poorly compacted, and that is what failed. Academics looked for a way to make vibrating unnecessary. Plasticisers were generally waste lignin from wood processed to make paper. Incredibly cheap with some electrostatic repulsion. Electrostatic repulsion is what makes two magnets the same polarity repel. The liquid in the wet concrete repelled itself and flowed better. Super-plasticisers work the same way. They are mostly naphtha based which means they are made from crude oil. Deliberately manufactured. Cost more. Better. But still it is only the liquid repelling the liquid. The Japanese academics came up with a much longer, far more effective molecule with more electrostatic repulsion; and they found a way to stick this molecule to a solid. It was better because neighbouring solids repel neighbouring solids. Solids slide past each other much better. The Japanese found that they could make what they call High-Performance Concrete very easily with PCE. PCE is what makes self-compacting concrete possible. Be more workable, cohesive, denser and stronger. Therefore the same strength can be achieved with less cement. Or waterproof concrete can be achieved with PCE, more cement and less water. Throughout Japan, Korea and China most concrete is made with PCE to reduce the amount of compaction needed and to make concrete with less cement. How the science has evolved in UK university libraries. 1988: "Theoretically, cement pastes with a water / cement ratio of <=0.5 achieve capillary discontinuity"
Lea, F. and Hewlett, P. (1988). Lea's chemistry of cement and concrete. 4th ed, p888. Oxford: Butterworth Heinemann. By 1988 no one had created the plasticiser that would make concrete delivered to construction sites sufficiently workable at 0.50 water to cement. Traditional plasticisers work by separating cement particles from flocculation with electrostatic repulsion. However the Japanese developed polycarboxylic ether polymer chains (PCEs) during the nineties. The backbone side of a PCE gets adsorbed while the side chains on the other side can have chosen chemicals added to them for a variety of benefits, not just for concrete. PCEs are used in textiles, printing, paint and cosmetics as well as concrete, depending on what useful chemical is added to the backbone molecule. The Japanese invented chemical to add that dispersed cement particles far better than Ligno or Naphtha chemicals. See Advanced Concrete Technology by Professor Zongjin Li, page 71 (2011), Wiley: New Jersey, for more explanation. This means completely waterproof concrete has been produced in Japan for nearly 20 years. In the same year this knowledge found its way into UK text books for the first time. Click on the image below to see all the BBA data plotted on our chart. Some data was missing, such as Caltite compressive strength test results, so I have made up missing data with my educated guess. 2011: "concrete with a low water/cement ratio ... make the capillaries discontinuous ... water would not be able to enter the interior of the concrete"
On the same page, under the heading Autogenous Healing "Fine cracks in fractured concrete, if allowed to close without tangential displacement, will heal completely"
Neville, A.M. (2011). Properties of Concrete. 5th ed, p330. Harlow: Pearson Education. The point is, UK university text books now teach students how to make completely waterproof concrete without admixture, and have been doing so since 2011. And we already knew that well placed, cured and suitably reinforced concrete stays good for centuries. We have 3 categories of science lessons. Click on any to go straight there. Text book explanation of how concrete can waterproof itself. Our guide explaining what we see as a scandal of BBA certification. Text book explanation of how concrete can waterproof itself. Written by Phil Sacre 2010 to 2015. Waterproof concrete, that is: concrete that is waterproof from water, sand and cement alone, is too dense for water to get through under pressure, by capillary action or as vapour. Waterproof concrete is totally waterproof. Deleterious chemicals dissolved in water (such as salt and oxygen) cannot penetrate waterproof concrete to attack steel reinforcement. Drying cracking cannot occur because waterproof concrete has insufficient excess water to dry off and create tension within. (Note. Flyash or microsilica would need to be added to concrete to give concrete sulphate resistance better than class two but great care is needed choosing the proportions to avoid leaving capillary routes between unreacted grains of flyash). Within the concrete industry: quarrying, cement manufacture, readymix and so on, there is a post-graduate diploma one can study for and a series of four text books contain all the necessary knowledge to obtain it. These are "Advanced Concrete Technology" edited by John Newman and Ben Seng Choo. I have read large parts of these books and this information paper is written as a direct result of the understanding I have gained, particularly from the chapters "Durability concept: pore structure and transport processes" by Lars-Olaf Nilsson in the Volume 'Concrete Properties'; "Admixtures for concrete, mortar and grout" by John Dransfield in the Volume 'Constituent Materials'; and "Concrete construction for liquid retaining structures" by Tony Threlfall in the volume 'Processes'. Two other important sources are the e-book "Understanding Cement" by Nick Winter (from www.understanding-cement.com); and "Advanced Concrete Technology", 2011, by Professor Zongjin Li of Hong Kong University published by John Wiley and Sons. Other sources have been used as well to increase understanding but not quoted unless acknowledged. Concrete is aggregate of various sizes, cement and water. It might also have cement substitute and chemicals such as water reducing agent. All these materials vary enormously and they can be in any number of proportions. Some concrete would be very porous and some very much denser. C35A is a standard mix design, containing extra sand and cement but less water by proportion compared to C35, that the water treatment industry uses for sewage treatment tanks because it is dense enough to prevent water visibly leaking. (This is known as water-tight). But it has capillary pores because the excess water providing the workability pushes all the solids slightly apart and vapour would always be lost from these capillary pores, so it is unsuitable (on its own) for habitable accommodation. Properly waterproof concrete is not only a very dense mix of aggregate, sand and cement. It includes the most powerful third generation super plasticiser so that it can be packed tight without excess water providing the workability. Pores close off. How waterproof concrete packs so tight that nothing can move within. Not an ion. Winter (2009) refers to Powers and Brownyard (1947) who calculated that the ratio of the volume of hydration product to the volume of cement from which it was produced is 2.2. Powers and Brownyard (1947), in Winter (2009), also calculated that cement needed 38% water by weight to fully hydrate but it would not have to have the room to do so. They concluded that in practice the cores of larger grains of cement would remain if there was less than 44% water by weight of cement. When cement grains adsorb water to create gel, that gel is a greater volume than the cement and water from which it was produced. When crystals are formed within the gel, water is released. This water is adsorbed by more cement to form more gel, within which more crystals are formed. Crystals intertwine and lock together, between cement grain and water, forming the strength that is concrete. This continues, according to Powers and Brownyard (and it would seem no one has challenged their findings in 68 years) until there is no room for any more gel to form because it cannot expand under the weight of concrete above it. The denser the concrete mix the more likely and the sooner that there will be no space left for gel to form. When, after many, many cycles of gel forming and water release, remaining water cannot form gel with remaining cement grain, because there is no room for any expansion, not even by just a few molecules, then nothing can move. Nothing, not an ion, can get through. The proof that relics of cement grain and water remain is autogenous healing. Fine cracks in suitably reinforced concrete that form days later when a concrete element restrained at both ends cools and contracts create room for gel to form and heal. 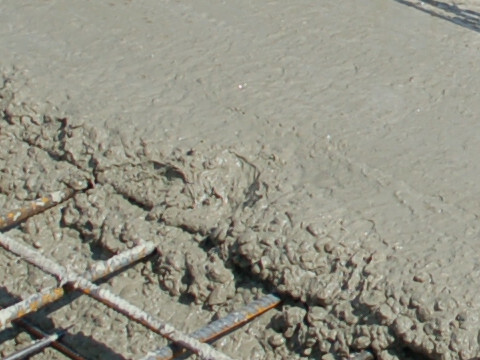 The extra cement partially reacts with much of the limited water until the concrete simply runs out of space inside (at which time remaining water cannot form gel with remaining cement). This does not seem to happen between grains of cement substitutes that have very limited reaction with water, such as flyash. Possibly because flyash is a spherical klinker, largely hollow and with a lot of space between packed grains. THE CONCRETE MIXES WE WILL COMPARE. Create 3 pictures in your mind's eye: fully waterproof concrete, C35 and C35 with extra water added on site against the rules. 55% water, so 110 litres(kgs), and a little WRA. This totals 2260kgs and there will be some air allowed to complete the cubic metre. say 1000kgs, 350kgs of pure OPC cement and only 45% water - which is actually more - 157.5 litres(kgs). This totals 2457.5kgs and any air should be removed during compaction. What goes on in these concretes? In our waterproof concrete there is enough sand to completely fill the spaces between the stones. There is enough cement to completely fill the spaces between the sand and, although there is more water, there is less water to coat each grain of cement. So, to begin with, all the cement grains are wet all over and just touching each other rather like mixed-sized marbels in a jar. Just the spaces in between are filled with water. The grains of cement are not pushed apart. In due course (this will be after the concrete is placed and compacted) the surface of the cement grains mix with the water coating their surfaces, forming gel. The gel takes up 2.2 times (1) the space originally occupied by the cement. So after the cement and water combine, gel from one grain is forced to mix with gel from its neighbour. Gel is forced against sand and aggregate as well. The reasons for this dramatic increase in volume of the cement are that to form gel the surface of a grain of cement takes up a great deal of water. Heat is given off as well and the rise in temperature causes thermal expansion. When crystals form from the gel not all the water within it forms crystals, so water is now released. But this is after the gel in such a tightly packed environment has been forced into any available space. Hours later the gel turns to crystals. The released water mixes with the new surface of the cement revealed after the first surface gelled and turned to crystals, the pressure pushes it through the first crystals thickening the continuous skeleton of crystals throughout the concrete. The secret behind fully waterproof concrete is the exceptional super plasticiser that gives the workability to completely pack concrete with vibration, there being no space taken up by water added only to provide workability. Cement and water turning to gel can only continue while there is space. Because initially the cement needs to expand 2.2 times to create gel. After only a few days the rate of change from cement and water to crystals of concrete is far slower because remaining water cannot get through the tightly-packed crystals already formed (2). The concrete is already completely waterproof. Within a few more weeks nothing has any space to move. No molecule of water can get through to any unreacted cement grain. The last gel to form crystals will always release water so there will always be free water left inside concrete. In our concrete it is trapped. However, if the concrete were to crack then the space created would allow remaining water to reach remaining cement, gel to form and turn into crystals and the concrete would self-heal (autogenous healing). Cubes made with waterproof concrete crush at well over 50N/mm2 after less than 28 days. In fact it almost stops gaining any more strength in less than 28 days because it runs out of the necessary space inside sooner than that. In comparison, our C35 mix has insufficient sand to fill all the space between the stones, insufficient cement to fill the space between the sand and extra water filling the extra spaces and pushing cement grains apart. So, when the cement begins to gel with water, more gels at once because there is more water available for each grain and more space for gel to form. With so much space available, the first gel from one grain barely mixes with the first gel from the neighbouring grain. Crystals form but they don't intertwine, they don't form a continuous skeleton, until much later. The skeleton formed out of crystals is not as neat or complete. Neither are the crystals from neighbouring grains so thoroughly interlocked. So, although after any short period more cement in C35 has crystalised - become concrete, it is not as strong a structure and the spaces between grains are connected allowing water to travel through. This sounds fairly awful. However, in practice, C35 is made with flyash as well which gives the skeleton a nice shape to form round. Whilst my picture above is true for waterproofing, in actual fact, with flyash, the crystal skeleton is quite neat and strong even though the flyash is barely involved. And that is why flyash concrete eventually becomes stronger. But flyash concrete will never be waterproof if cement gel cannot get in to the water-filled space between neighbouring grains of flyash. If flyash reacts at all with gel it is only the glassy surface, expert opinion differs on this. C35 but with water added on site. The most common structural concrete in use in the UK. We can also picture the worst mix, C35 that the workmen wetted up with more water. The water-filled spaces are bigger so lots of gel from one grain needs to form before any mixes with any gel from its neighbour, reducing strength considerably. Poor concrete with too much water is very weak and porous. Because the exposed surface of any concrete can expand freely, when water is added on site and formwork removed within hours, concrete that should protect reinforcing steel, such as our motorway bridges and sign supports, is free to expand as it cures and becomes extremely porous which is why the Hammersmith Bridge, the bridges along the M62 and so on, cost more to upkeep than they cost to build. We still use the ridiculous system so condemned by the Latham report years ago, that consultants draw up long-winded specifications that form the basis of adversarial contracts that cause everyone to cheat. And no-one polices any of it. The system just wastes money and results in poor concrete. Clients who want a quality job might consider bringing back the hated Clerk of Works. Let us now consider porosity. How easily water might be pushed through under pressure, for instance water outside a basement wall; or pulled in by capillary action. The wetted up C35 is full of water anyway. So water will flow through easily. The C35 is denser but there is still inter-connected water, so, under pressure, water may be pushed through. But, for certain, if water dried from the concrete, let us say into a basement so the basement feels and smells damp, capillary action would replace the water in the concrete whenever any was available. I have explained that, in the waterproof concrete example, no molecule of water can travel the microns through crystals to get to more cement; and remaining pores containing water are not connected. In fact, nothing can move. To put 'nothing can move' into perspective, it may be a whole year until absolutely nothing, not a single ion, can move anywhere at all. But from site experience even before any structure is sealed and backfilled nothing could travel right through concrete with extra cement, limited water and PCE plasticiser. These pictures now in your mind's eye are evidenced by BS 8007:1987. 'Code of practice for design of concrete structures for retaining aqueous liquids'. This standard contains a mix design for concrete of structural strength that will not allow any visible sign of water through. This is called C35A, the A standing for Aqueous. The mix is for use with structures that will retain aqueous liquids, such as sewage treatment plants and water purification plants. Water will not visibly be seen to leak but water is allowed to dry off as vapour and be replaced by capillary action. This is known as watertight rather than waterproof. It relies on some extra sand, some extra cement and a little less water than a readymix supplier would put in a plain C35. Chemicals deleterious to reinforced concrete are either those that attack the concrete or those that attack the steel. Anything that can attack steel needs to be dissolved in water to do so (mostly road salt and oxygen). By keeping out the water on the surface very good C35 and waterproof concrete protect the steel. Very good (well made as well as well placed on site without adding water) C35 possibly for 60 years, a waterproof concrete indefinitely. The other chemicals that attack the concrete do so at the surface. These are mainly sulphate in aggresive ground and sea water and carbon dioxide. The solution here, no matter what the concrete, is to add a cement substitute that the salt and carbon dioxide cannot get through: Fly ash, GGBS, microsilica or volcanic pozzolan (which the Romans discovered proofed concrete against sea water). With a substitute in the concrete, when PC cement crystals are eroded the chemical will quickly expose a surface of alternative material it cannot attack, and the structure is protected. Note that concrete containing flyash or GGBS may need curing for up to 56 days to get all the benefit. Concrete with cement substitutes may not be able to become fully waterproof on its own. The user may need to fund research. Equally important as the concrete is the reinforcing steel within it if the concrete is to remain waterproof. I have another page dealing with the minimum steel requirement in waterproof concrete here. In a nutshell, a waterproof concrete structure will cool after setting and the stresses will cause cracks within it. The job of the steel is to take up the strain across a crack limiting its width to a space that the concrete can self heal. The correct steel makes concrete crack and heal many times instead of opening up one wide fissure. I, Phil Sacre, am not a chemical company. I was a Land Surveyor and what is now called a Construction Materials Technician in the British Army, turned site engineer turned basement expert who got some sets of letters after his name in the 90s and since studied concrete technology a lot further in the library at Kingston University. It is my preference to increase the horizontal reinforcing steel to 0.35% to restrict crack widths in the hotter environment of fully waterproof concrete. However the alternative practice of pouring no more length than 3 times the height, leaving the ends of pours free to shrink and fill in short gaps later, is perfectly valid. It just means a lot more work creating stop ends and if you are buying tapes or strips you will be persuaded to buy a whole lot more. I have thought about these issues more than most. No one could stop all the men on every site wetting up C35 with more water. The workforce would not be adding too much water to get the workability they want to make their work easier and quicker. A PCE super plasticiser would do that for them harmlessly. Even if they broke the rules and added 5% more water to the 45%, the concrete would be so ridiculously fluid that that is all they would ever add and the concrete would still not exceed 50% water so the steel would be well protected. The concrete cover between any steel and the surface would be much stronger when they removed their formwork too soon so sufficient depth of concrete would become dense enough to completely protect reinforcing steel for hundreds of years even if a few mms at the surface were ruined because that concrete dried out too soon. What I see as scandals of BBA certification. There are a few factual sources. However three stand out. The UK's Concrete Society paper: "The influence of integral water-resisting admixtures on the durability of concrete." Prepared by a Working Group of The Concrete Society. Published January 2013. A standard text in university libraries: Neville, A.M. (2011). "Properties of Concrete". 5th ed. Harlow, Essex: Pearson Education. We quote parts of the society's paper and give you some page references alongside the excerpts so that you might find the passages for yourselves, if you buy your own copy. The book by Neville can be found in Kingston University Library and no doubt other university libraries where they teach construction. What these quotes from the Society's paper lead me to conclude is that the BBA, the organisation most trusted by architects and engineers to test products they might specify in construction, is guilty of bias, coercion and falsehoods. That the organisation in question falsely certified a product that became the most expensive of its type and market leader. In addition, the Society's paper quotes another research paper with unequivocal evidence that one of the products with a BBA certificate does not work, does nothing, in the situation for which it is certified. In the situation for which it became market leader and the most expensive. I discuss those products that are referred to by the Society as Water-resisting admixtures for concrete. Their purpose is to reduce the amount of water that might get through a concrete structure that needs to resist water ingress. A basement is the most obvious example. In one quotation it mentions a diaphragm wall. A diaphragm wall is a wall made in the ground by filling a series of short, deep trenches (or slots). You can see an explanation here. The reason a diaphragm wall is such a good example is that without exception the water-resisting treated concrete is against original (and therefore damp or wet) ground from the start. However all basement walls are soon backfilled on the outside with damp earth usually open to rainfall, so the same conclusion applies. It is time, in this explanation, to point out that the market leading and most expensive product is Caltite. This is produced and sold in this country by Cementaid (UK) Ltd. The full quote from the Society's paper is here but I have added colours to highlight parts. From page 26. Neville seems to have overcome his doubts as they are not mentioned in the later edition (Neville, 1995) of his textbook nor in his report to Cementaid (Neville, 1988) on tests conducted by Taywood Engineering (Price, unknown). These tests were conducted to assess the use of Caltite in concrete for enhancing the durability of precast tunnel lining segments, with a view to it being used for the channel tunnel. The Caltite concrete performed better than the control concrete in water sorptivity, ISAT, water absorption and water permeability, while the chloride penetration test was deemed to be inconclusive. Neville concluded that the results show that Caltite upgraded what was already a high-quality concrete and the question to be considered is whether such upgrading is necessary or justified, bearing in mind the additional cost of the Caltite system. He added, "For the exposure conditions encountered in the UK, the answer would depend on the consideration of the life of the structure, cost of repairs, the ease with which repairs can be affected and the economic aspects of any disruption caused by the repairs." Aldred (who was once the technical director of Cementaid) has reported the benefits of Caltite in many publications. In one such paper (Aldred, 1987) he reports that in 1984 cores were taken from several old concrete structures located in the tidal and splash zones around Australia. In one structure with 11 years exposure to marine wetting and drying, the plain concrete showed evidence of aggregate exposure and steel corrosion, while the adjacent Caltite concrete (same cement content and water/cement ratio) was in excellent condition. The history and development of Caltite is also recorded by Aldred (1988). In another paper (Aldred, 2001) he concluded that the addition of Caltite in concrete with a water/cement ratio of 0.6 generally reduced water transport both when specimens were initially saturated and when specimens were initially dried. However, the use of Caltite in concrete with a water/cement ratio of 0.4 was found to reduce water transport only when the concrete was dried before testing. The fact that the relative improvement over the control concrete was greater under conditions of high water/cement ratio, limited curing and greater degree of drying led the author to suggest that the admixture tended to influence water transport through larger voids and pores, and that Caltite concrete may therefore be relatively insensitive to a certain level of site abuse. Aldred also concluded that the use of Caltite may not be effective in reducing water transport for concrete with a low water/cement ratio and no opportunity to dry before exposure, such as diaphragm walls. The diffusion of water vapour through the Caltite concrete was shown to be similar to the control concrete. In the first of these 4 paragraphs, Neville is quoted saying that Caltite upgraded an already high-quality concrete. I have presented to chartered engineers the argument that they should specify a PCE concrete instead of a proprietary brand with a BBA certificate. But they always bit back at me asking what guarantee comes with just a chemical and is it as long as the Caltite guarantee. They are misled because the Caltite guarantee, and I have copies from Cementaid dated 2005 and 2015 (I display one here) is limited to only what can be expected of high-quality concrete. No additional benefit of Caltite is included in the guarantee. The site filled form at the end also makes it clear that Caltite do not warrant workmanship. However, if the tunnel segments described had been oven-baked before use we think Neville would be reporting better chemical defence. This is because Caltite includes a long polymer chain in emulsion that, if dried, would set to form bitumastic-like plugs which would prevent anything getting in or through. I believe this is evidenced in the second paragraph where the concrete is sun-baked in Australia's sun. The two reports in the third paragraph are for a wet concrete (water with a mass of 0.6 the mass of the cement) and a dry concrete (water with a mass of 0.4 the mass of the cement, or only two-thirds the water in the wetter sample). We are told that the Caltite made a difference in un-dried concrete that had been a wet mix but not in the dryer mix unless it was dried first. The phrase "Caltite concrete may therefore be relatively insensitive to a certain level of site abuse", to my practised mind, could be re-written as "If the site labour add a lot of unauthorised water to the concrete, Caltite will limit the damage a bit". Please hang on to this thought till later. We will see in the Society's report what they think of these differences in concrete without Caltite. In the fourth paragraph we see the evidence that no engineer can be certain that Caltite makes a beneficial difference when used in concrete that is used beneath ground. Basements being the obvious example. The Society's paper was looking at protecting reinforcing steel in concrete from deleterious chemicals. Deleterious chemicals have to be dissolved in water as ions to attack steel. So any water-resistance equals resistance to chemicals since they are prevented by water-resistance from reaching the steel. All deterioration mechanisms in concrete rely on the presence of water to a greater or lesser extent and, with the exception of carbonation, reducing the internal moisture content will lessen the risk and/or extent of deterioration. The use of water-resisting admixtures would therefore be expected to increase durability and extend the intended working life. 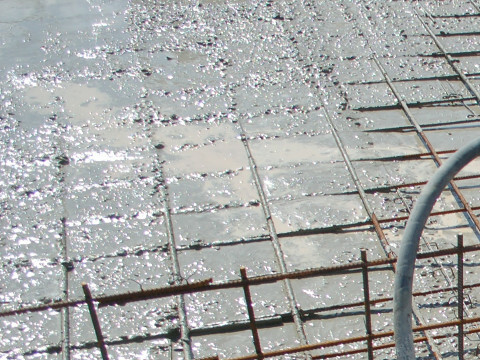 The capillary pores are present as a result of the excess water added to the concrete to provide adequate consistence for placing but not consumed by the cement hydration. Any excess water that is not used up during cement hydration remains in capillaries running through the concrete. The less excess water used in manufacture of the concrete, the smaller and more discontinuous the capillaries in the hardened concrete, with a consequential reduction in permeability and absorption. This has resulted in water/cement ratio being used as a primary measure of water penetration and hence the durability of the concrete. (Note. Consistence used to be called workability. A layman might call a consistence runny or stiff). Page 49 mentions C35A concrete (C35 is a strength classification, the most usual strength in structural concrete, while A stands for Aqueous): The British Standard BS 8007: 1987 Design of concrete structures for retaining aqueous liquids (now withdrawn) (BSI, 1987) recommended the use of a C35A concrete, which it states will: "in general ensure that the strength, durability and impermeability will be adequate for liquid-retaining structures". From BS 8007: A pure OPC cement concrete mix should have a maximum 0.55 water to cement by mass. Therefore we can deduce that something changes in concrete between 0.60 and 0.55 water, the change being permeability. The BBA certificate for Caltite specifies that the concrete ordered for use in construction, that Caltite will be added to, must have a maximum of 0.45 (or 45%) water by mass of cement. You will recall I highlighted that Caltite made a small difference in a wet mix with water 0.60 (60%) the mass of cement but none when 0.40 was used. The BBA certificate directs that no more than 45% water is used in concrete to which Caltite is to be added. We can see that 0.45 (45%) concrete will be more water-resistant, with or without Caltite. But my issue is that the Concrete Society have spotted that the BBA used a wet concrete mix to prove that Caltite made a positive difference while certifying and specifying a far dryer mix, and we have seen the evidence that Caltite would have made no difference. THE FALSEHOOD. (See the BBA certificate on the BBA web site here, as long as it is still the 2012 version) BBA do not appear to have tested Caltite in the mix specified on their certificate. BBA has issued a certificate stating clearly for use in basements when there is academic evidence Caltite will not usually work in that environment, because basements are backfilled with soil open to rainfall and water in the surrounding ground. To me, the certificate is void and the BBA do not deserve their authority to be a testing organisation. This is the first scandal. The BBA has also produced certificates for other water-resisting admixtures approving concrete mixes with slumps that, according to the figures it publishes on these certificates, is too stiff to pump on site. I think these other certificates are void as well because they have not reported test results on concrete similar enough to what contractors will buy. I go through each of the certificates on my Other pages. But the scandal does not stop here. Page 49, which has the reference to C35A, has a lot more to say casting doubt on the benefits of any water-resisting admixture. But I accept there is nothing unlawful with selling sand to the Arabs or ice to the Eskimos. That's business. The issue that remains is whether BBA coerced the others to protect Caltite and, for the most part, I think they did. The Society created a chart on page 17 (figure 4.1) using only the data on the BBA certificates issued for 7 of the water-resisting admixtures. The worst end on their scale for permeability was set at 'typical structural concrete', concrete designed for strength without permeability in mind. Caltite is not on their chart, the Caltite figures with and without Caltite on the BBA certificate being more permeable than the typical structural concrete. The concretes containing water-resisting admixtures all had lower values than any of the controls. All of the values (control concretes included) were within the range for 'Low permeability' concrete (The Concrete Society, 2008). In all cases water permeability was reduced by between 40 and 80% of the control. The results from the Caltite concrete are a different order of magnitude from the other six materials but are more representative of typical structural concrete with values in the order of 10 -12 m/s (see Figure 4.1). Other suppliers used control concretes with permeability coefficients in the range 0.003x10 -12 to 0.932x10 -12 . The least permeable control concrete used by Pudlo was less permeable than all of the concretes with water-resisting admixtures. If this is a true value it indicates that a water-resisting admixture is not necessarily required in order to achieve a concrete with 'low' permeability. Indeed, all of the control concretes with the exception of that used by Caltite appear to have out-performed normal concrete (which achieves a value of about 10 -12 m/s at water/cement ratio = 0.4) in some cases by a factor of more than 100. This casts some doubt about the absolute values reported and demonstrates the difficulty in assessing the relative performance of different materials. The Society makes it clear that all the products made the control concrete used more water resistant. The Caltite control concrete was so poor that even after being improved with Caltite it was not as good as 'typical structural concrete'. This is the evidence that the BBA test results published on the certificate bear no valid relationship to the specification on the certificate. Surely this is fraud and a criminal offence. 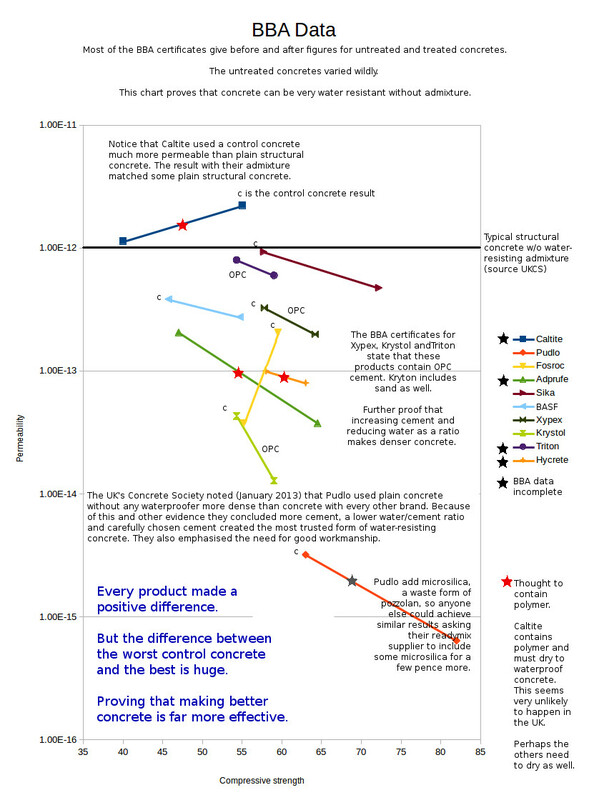 The other 6 brands with certificates were all tested in control concrete the Society says was already better than 'typical structural concrete' yet they were all very different to each other, making comparison very difficult. One brand used control concrete considerably better than all the other treated concretes. It is my suspicion that all of the 5 brands better than Caltite but which did not use a control concrete as good as Pudlo, would have used a control concrete as good as Pudlo had they been allowed but that BBA forbid them IN ORDER TO TRY TO PROTECT CALTITE IN THE MARKET. Yet the BBA's reputation is completely solid. Architects and Engineers, as well as local authority building control officers, have been educated to accept BBA certificates without question or further research. The culture is such that if they can tick the box the product is acceptable. The culture continues to absolutely forbid any contractor using anything contrary to what is specified by the engineer. So whilst engineers have faith in BBA and specify a BBA certificated product (sometimes they add 'or similar' but this is always taken to mean 'also with a BBA certificate'), no product without a BBA certificate can be considered by any part of either the supply or delivery chains. You will be asking why doesn't someone get a BBA certificate and insist on fair testing of a PCE? PCE plasticiser will disappear within a few hours having made the concrete runny without extra water. It is not in the concrete when the concrete has hardened enough to be tested. BBA Product Certification is completely inappropriate. However testing Depth of Penetration of Water Under Pressure On Concrete to BS EN 12390-8-2009 is entirely appropriate and proves whether the concrete actually used in the structure is impermeable or not. A user of PCE plasticised, over sanded, extra cement, reduced water concrete sent us these photos of concrete from two trucks, one straight after the other. Both concretes are P360, CEM 1, max wcr 0.45 and over-sanded. However the usual dose for 6 cubic metres was added to both trucks but the first had 8 cubic metres on board and the second only 4 cubic metres, so the second photo has twice the PCE plasticiser in the first. You would think that the difference in water to cement is massive but the batcher insists both were the same. The difference shows the power of PCE plasticiser. Incidentally, the manufacturer of the PCE used here recommends using much the same amount of additive as in the second photo, or even more to make concrete self-compacting, but if there is a delay between trucks slab joints can look very messy if the two batches cannot be knitted together. There is no issue that the joint might not be waterproof, that will be because the weight of the next concrete will displace enough of the laitance. But 20mm stones are not very good at pretending to be 1mm to 19mm thick if the old concrete under the new has become stiff. 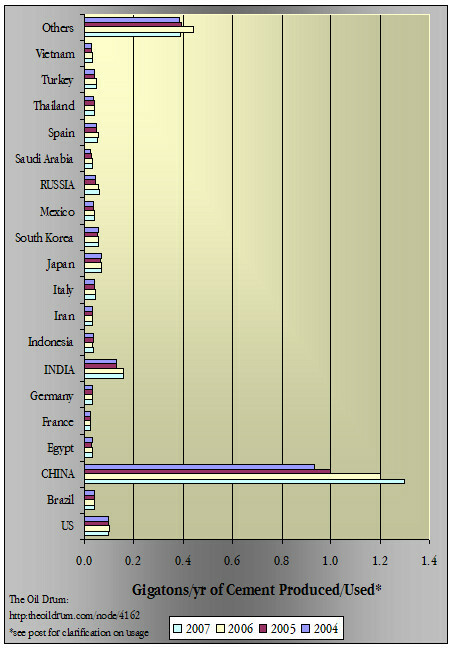 So most of the rest of the world is using more waterproof concrete than the UK, usually for a tiny fraction of the price we pay for Caltite and others. BBA certification has harmed our nation's competitiveness. These issues need discussing in the open, in professional magazines and at meetings of professionals. And before anyone reading this gets too pompous about the importance of the UK in terms of concrete, this chart from the New York Times web site, published in 2008, puts the UK in "Others". It would surely be stupid to maintain we have nothing to learn from anyone else.